Welcome back to Butterfly Book Club for 2017 – I hope to have lots more fabulous picturebooks to share with you this year, plus a few novels tossed in too for good measure because why should parents miss out? 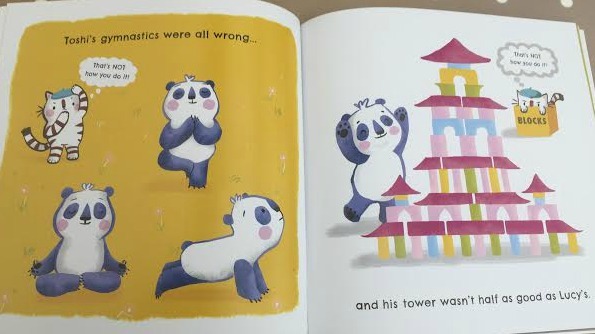 Today’s book is so adorable, and as with all my favourites, has a brilliant message for little ones too. That’s NOT How You Do It! 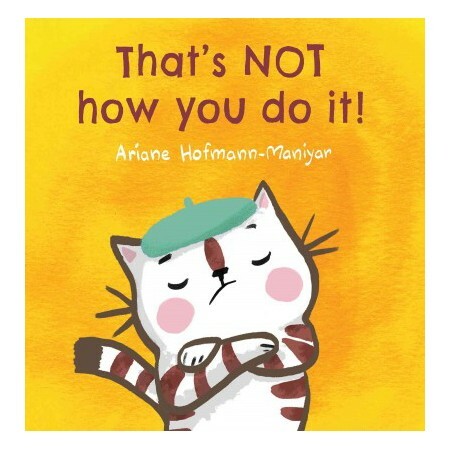 by Ariane Hofmann-Maniyar tells the story of a cat called Lucy who is an expert on everything, so much so in fact others come to her for help all the time. Music, gymnastics, art – you name it, Lucy is the best – and I think perhaps a little smug with it. One day a panda named Toshi arrives and shakes Lucy’s world a little. Toshi does things very differently, and to Lucy – wrongly. Eventually, Lucy loses her temper when Toshi’s paper star making skills don’t live up to her expectations and it’s only then that she realises that, not only is Toshi very kind, but the way he does things isn’t wrong, just different from her. I love that through the illustrations adult readers are able to see that Toshi is actually just bringing ideas from his culture to Lucy’s world, way before Lucy realises this herself. Younger children will likely follow Lucy’s train of thought so the end of the story teaches them a lovely lesson. Firstly, about the importance of accepting other people’s cultures and traditions and secondly, about learning to be humble and accept that you wont always be the best at everything and that’s okay. Learning from each other and being accepting are such valuable traits and I love how cleverly this message is conveyed. Our modern world is so diverse and I love having an opportunity to teach Caterpillar about that. Storyline aside, the illustrations are a real treat too. Using a mixture of techniques, we’re offered a festival of colour and details – I especially enjoy how the simple marker medium is used to create such comical, attitude-filled expressions for Lucy. Find out more about That’s NOT How You Do It! by visiting Child’s Play Books. To find more fab children’s books visit our book club pages.